North Vancouver-based research and development firm in wearable technology, Vandrico, has released a well-put together and detailed infographic, highlighting wearable tech’s past and future. The infographic showed the beginnings of wearable technology, with things people wore on their bodies that executed a technological function. Examples were the Qing Dynasty’s Abacus Ring in 1644, the marine chronometre pocket watch in 1762, the digital wristwatch in 1972 and eventually the bluetooth headset in 2000. Currently, Vandrico see’s the wearables market divided into four distinct categories: Activity Monitors, Smart Watches, Heads Up Displays and Virtual Reality. 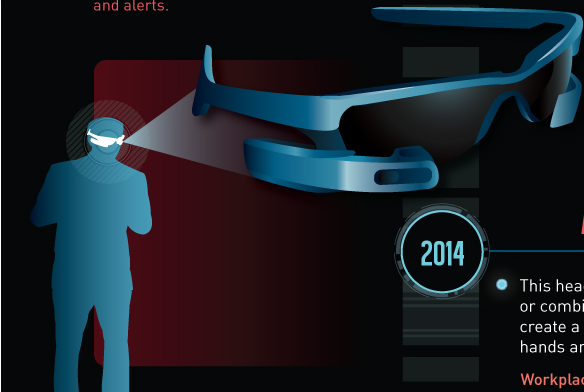 Business Insider predicts that the wearables market will hit $12 billion by 2018. Current examples detailed 2008’s Fitbit, 2012’s Oculus Rift, and 2013’s Galaxy Gear and Google Glass. Potential wearable tech for the future, according to Vandrico, includes “Smart Safety Glasses”, a heads-up display with a truly open platform that instantly delivers information to the users eye, and augmented reality headsets that can create a virtual workspace.